What does bird is the word mean? Bird is the word is a reference to the main lyric of the 1963 hit single "Surfin' Bird" by the Trashmen, notably featured in the plot of a 2008 episode of the cartoon Family Guy. Hi, I'm Peter Griffin. 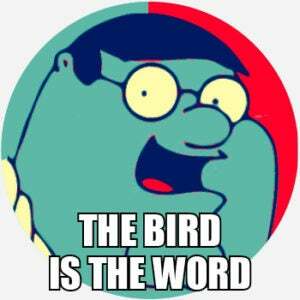 According to Gallup Polls one in 12 Americans is unaware that the bird is the word. I dream of an America where everybody knows that the bird is the word. Bird is the word for residents in the Coeur d’Alene area this month...After just a week of breaking the record amount of bald eagles counted on Lake Coeur d’Alene, the record was broke again Thursday. "The box has everything they need to make a Thanksgiving dinner, so it's a little different than your average food box, and a lot of our families that we serve have really, really big families, so a turkey goes a long way," Nicole Pena said...Even though right now bird is the word, Nicole says they hope their help can extend beyond the Thanksgiving table. Where does bird is the word come from? “A well a don’t you know about the bird? While The Trashmen’s inspiration for “Surfin’ Bird” is well-documented, the exact origin and meaning of the saying bird is the word is less clear. Bird has carried many slang connotations throughout its history, from “prostitute” to “the middle finger.” In the context of the song, and in subsequent contexts, bird is the word characterizes something as good, cool, or new and revolutionary. The Trashmen’s “Surfin’ Bird” peaked at #4 on the Billboard charts, later inspiring fun or ironic covers by popular performers from The Ramones to Pee-wee Herman. The song, and phrase, rose to new prominence in 2008 when it was featured on an episode of animated TV show, Family Guy. In the “I Dream of Jesus” episode of Family Guy, the main character Peter Griffin hears “Surfin’ Bird,” his favorite song from childhood, playing from a jukebox at a 1950s-themed diner. The owners plan to throw away the vinyl record, but Peter takes it home with him instead. He becomes annoyingly obsessed, crafting conversations to end with the song as the punchline. He dances and sings to the song at every opportunity and even films a commercial based around the song. His dog Brian and baby Stewie destroy the record in hopes that it will curb Peter’s obsession, to no avail. Who uses bird is the word? The vast majority of contemporary usage of bird is the word is a direct reference to either the contagiously but obnoxiously repetitive lyrics of the original song or, more so, to the Family Guy episode, which mocks its infectious repetition. Much common usage of the phrase mirrors Peter’s jokes from the popular Family Guy episode, with people contriving conversations to deliver bird is the word as the punchline. Food writers and restaurant critics also use the phrase bird is the word when describing a delicious dish that contains chicken or other poultry. Writing about actual birds (e.g, bird-watching, avian research) may also use the recognizable phrase.